Looking for some water themed activities for kids? Look no further. Here you will find an extensive list of activities that are water based. These water activities are perfect for the spring and summer months of school where kids are getting anxious for summer break. Water games, arts and crafts, and much more. Sprinkle unsweetened Kool-Aid on a piece a paper. Have the children move a piece of ice over the Kool-Aid. Watch as the Kool-Aid turns to liquid and makes a yummy smelling picture. Sprinkle Kool-aid crystals onto a piece of paper. Have children spray water from a spray bottle onto the paper. Use different colored kool-aid mix. For added adventure, you may choose to take children out into the rain with a piece of paper that has Kool-aid on it. Cut tissue paper into desired shapes. 1. Have children place tissue paper on other paper and spray with water. 2. Remove tissue paper to see how it bled and created designs on the construction paper. Give children a piece of paper and a small bowl of water. Set out some different colors of dauber pens. Children take daubers and dip the tip into the water. Then slightly smash pen onto the paper. The water will splatter the paint out. Repeat with other colors of pens. Splatters will create interesting designs on the paper. Fill a plastic dishpan with water. Have the children help grate various colors of chalk into powder. 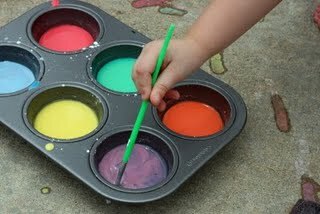 Let each child choose 2 or 3 colors of chalk and sprinkle the powder on top of the water. Next have children float a sheet of paper on top of the water to absorb the chalk design. Hang the shapes on a line or lay flat to dry. For variation use India ink on top of the water instead of chalk. Swirl to make a design, then lay the paper on the water’s surface to absorb the design. Materials: A clean, empty two-liter plastic bottle with a cap, clear vegetable oil, water, a funnel, blue food coloring, shells and sea creatures (available from craft stores- be sure to use lightweight items that float), one teaspoon of glitter, white craft glue and a hot glue gun (to be used ONLY by staff or supervised by staff at all times). Fill bottle halfway with water. Add a few drops of blue food coloring and swirl around to mix. Add glitter and sea creatures/shells and then fill bottle the rest of the way with vegetable oil using a funnel. Make sure that cap and rim are dry— and then apply white glue around the rim and seal cap. Use a layer of hot glue around the outside edge of the cap for additional protection from leakage. Turn the bottle on its side to create a wave in this ocean habitat! From Kids domain website. Ocean Treasure”–add coins and beads! TIP: If you have trouble getting the entire label off – you may want to place a label over the ‘old laaber’ and write the “childrens’ names” and “Ocean in a Bottle”. A fun alternative to chalk! You will need equal portions of water and corn starch. Mix well. Add a drop of your favorite food coloring! Fill a large plastic soft drink bottle about one quarter full with water. Add a few drops of blue food coloring and a very small drop of liquid detergent. Pour in a small amount of clean sand or aquarium gravel. Blow up two small balloons, release most of the air, then tie the ends closed. Push the balloons into the bottle and screw the cap on tightly. When you have finished, you will have a fish tank with two bobbing “fish” inside. The fish will swim in the water by holding the bottle sideways and rocking it back and forth. You may just discover that each child will want one of their own. 4 jars with lids, dirt, sand, salt, gravel and a large pitcher of warm water. Have the kids help pour the warm water into each jar. Add one of the elements to each jar, and cover it tightly. Have children predict what will happen when you shake each jar. Shake them one at a time. What happens in each instance? Which of the elements dissolve in water and which ones sink to the bottom? The children may want to bring in other nature items/substances to continue this experiment. One drop at a time, use a medicine dropper to drop water onto a penny. How many drops will the penny hold before the water spills? The amount may be a surprise! Gather different items such as a variety of cans, coins, pencil, etc. and a large bowl of water. Small aquariums are good for this. Clear plastic tubs also work. Fill a bin or aquarium or tub half full with water. Place everyday items near the bin. Get the kids to guess which items would sink and which ones would float. WHEN COMPLETE…cup up and serve the watermelon for snack! A watermelon will float because its mass is less than the mass of water it displaces. This is due primarily because the inside of melon is hollow. It is mostly air, which has a much lower mass than water. Fill two jars with the same amount of water and mark the level of the water on the outside of the jars. Put a lid on one of the jars. Put the jars in a sunny place for a few days. Discuss with children what happened. Have children note that there is more water gone from the jar without lid and that inside the jar with the lid they can see tiny drops of water. Leave it in a warm place for a few days. Questions to ask: What happens when salt dissolves in water? What happens to the standing salt water after a few days ? Why? 16. Nice for Pre-K/K…COLORED ICE CUBES…This is a nice visual experience of COLOR CHANGES. Make red, yellow and blue ice cubes using food coloring and water. Place one red and one yellow ice cube in a ziplock baggie, one red and one blue ice cube in a ziplock baggie, and one yellow and one blue ice cube in a ziplock baggie. Place them in the science area. As the colored ice cubes melt they create new colors. Here is a great little “science” project that will amaze younger children. Leave it out of water to 1 – 2 hours until it starts to wilt a bit. Cut 1″ from the stem. Place carnation in red-colored (or other color) water made by adding red food coloring to water. Cover 6″ of stem with water. Observe what happens to the carnation. Make tie-dyed looking red, white and blue carnations. These flowers look great for any red-white & blue theme!. Pour water into a glass of water. Add 7 to 8 drops of red food coloring to the glass. Pour water into another glass and add 7 to 8 drops of blue food coloring to the glass. Cut the stem of a white carnation lengthwise. This will make the carnation stem into two thin stems. Set the two glasses of colored water together. Put half of the stem of the carnation into the red water and the other half into the blue water. Let the carnation sit for a few hours. The carnation will begin to change gradually into red and blue. Take the flower out of the mixture in just a few hours before the colors can change the white carnation entirely. You want it so that some of the white is still on the carnation. Wrap the stems together with green thread and place the carnation into a clear vase of water. Make several flowers and show off your beautiful red, white and blue flowers in a vase. To make each cone, place crushed ice in a paper cup. Mix one part unsweetened frozen apple or orange juice concentrate with one part water. Pour the diluted concentrate over the ice. Freeze orange juice (or any other flavored juice) in ice cube trays. When frozen put frozen juice cubes in a plastic bag to store. Put three to six of these cubes at a time in a blender. Pulse the blender -on then off, on then off, until cubes have a snowy consistency. Pile into a cup to serve. TIP: If you blend the entire batch at once, it will keep its carnival consistency stored in a container in the freezer. Kids can serve themselves. Adding a little water makes it “slush”. Even kids who don’t care for orange juice like it this way! How about making some good old fashioned lemonade?! This lemonade is quick and easy and refreshing on a hot summer day. Pour a large pitcher and garnish with fresh raspberries, cranberries or slices of lemon. Cut 1/2 OF ONE LEMON into thin slices and set aside. Juice a(Squeeze) the remaining 9 1/2 lemons and pour into a glass pitcher or punch bowl. Stir in the water and sugar until dissolved. Pour in the crushed ice and float the lemon slices on top. You could also use a ‘lemonade mix’ to make lemonade. 1. Make lemonade a couple ways…Regular and Pink Lemonade (frozen) mix from a can–Home made lemonade and powdered mix lemonade. You could also make JELL-O (It starts out liquid and turns solid…science and snack in one! Place cold water in large, clear, glass jar. Add tea bags. Cover top. Put in sun tea is desired strengh. Remove tea bags and drink over ice.Add sugar, lemon, mint as desired. Tip-Since water is not boiled, keep refrigerated and drink tea within one to two days. Compare the sizes of containers by filling one with water–then PREDICTING whether another will hold more or less. Test predictions. Supply a variety of SPONGES. Which will hold the most water? Add bubble bath to a tub or sensory table. Have children whisk away and play with the resulting bubbles! If you have older kids…how about organizing a car wash? This could be a ‘fund raiser for a community service, school, or child-care program’! Set up a ‘lemonade and ice cold water stand’! Sell the cool beverages while people are waiting for their cars to be washed! 26. DON’T FORGET THE BUBBLES! Supply children with bubble mix and bubble wands to make them. A few black bags to collect all the wet paper when the groups are done. Save all those liquid dishwashing & ketchup/catsup plastic containers. When empty, clean them up and make great “squirt each other” bottles! Marvelous for water fun! Put these on your wish list to parents to get a large supply! Instead of a car wash…have a toy wash! On a hot day —take all washable toys outside and let children have fun washing them. Children cool off…and YOU get clean toys!!! Great for End of the School/Day Care, or Summer Camp!!! 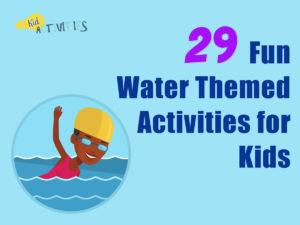 If you combine some of the above ‘Water Themed Ideas’ with activities from the ‘Outdoor Water Games and Fun’ page-you’ll have an amazing ‘Wet and Wild Water Theme’ for a day, week or longer! KIDS, HEAT AND WATER NEEDS! How much water do kids need when playing outside? WHEN IT’S HOT OUTSIDE… and kids are playing sports—or even just actively playing—head off problems by making sure the kids drink fluids before, during and after activity. As a guideline, encourage at least 4 ounces of fluid every 15-20 minutes, or whenever there’s a break or time-out. Tip: One ounce equals about one “gulp.” So kids need a minimum of 4 GULPS OF WATER EVERY 20 MINUTES! There you have it, 29 Fun Water Themed Activities for Kids. Make sure you check out our fun outside games as well. This page contains Water Facts, Information and Trivia to discuss and/or write about with your students. is shallow, narrow, natural body of of flowing fresh water confined by opposing earthen banks running in parallel direction with the steam’s flow. In general, streams run slow enough and are sufficiently shallow and narrow enough to be safely traversed without the aid of watercraft. is a small, shallow stream with a more rapid current, often characterized by a rough or rocky bed. is a small, shallow stream of generally slow moving water, often characterized by a smooth or sandy bed. is a creek that flows intermittently between higher and lower land elevations with varying depth and speed depending upon changing seasonal weather conditions. An arroyo may transform almost instantaneously from a dry shallow to a swiftly moving body of water. In dry, mountainous areas, arroyos are often the source of flash floods. is a larger body of water continuously flowing downhill over considerable distance from smaller upstream sources to a larger downstream reservoir, lake, sea, or ocean. Rivers are generally deep enough and wide enough to require the use of watercraft. is a narrower, shallower body of swiftly flowing water connecting two larger, deeper bodies of of water. is section of fast moving water characterized by a rough, rocky bed and precipitous changes in elevation. The white water refers to the bubbling, roiling foam that results from the swift water flow twisting and turning over a winding uneven bed. refers to a shallow basin of still water of less than ten surface acres. They may occur naturally, but are often man made. (loch) is a large body of relatively still (usually fresh) water which is nearly or completely surrounded by land. Lakes may result from the accumulated flow of streams (either above or below ground level), or from mountain or glacial run off. Lakes are characterized by broad basins and may vary in size from approximately ten surface acres to several hundred square miles of surface area. is similar to a lake, but is the result of human engineering. Reservoirs may consist of a natural basin flooded by the deliberate damming or redirection of natural waterways, or they may be entirely manufactured by mechanically pumping water into large lined basins. is a large body of relatively deep (usually salt) water with limited or no connection to the greater oceans of the world. is a vast body of salt water forming the interconnected waterway that surrounds the entire world. Oceans are deep and derive their currents from a complex system variable water temperatures and weather systems borne out of their varying depths and their absorption of the sun’s radiated energy. Recreation…swimming, boating, fishing, skiing, etc. Did you know that World Water Day is March 22 each year?